Mozilla just approved my latest update to the Better Gmail 2 Firefox extension, which now includes the ability to hide your unread Buzz count, and enable an audio notification when you receive new mail. 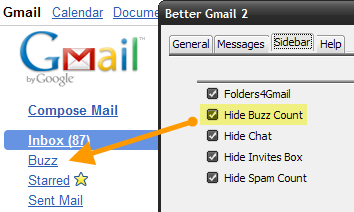 Thanks to Victor Zhang for creating the Hide Buzz Count script and Yansky for Gmail Sound Notify, and for giving me permission to include them in Better Gmail 2. Press play below to hear the new mail notification sound. If you’ve already got the extension installed, click on the “Find Updates” button in Firefox’s Add-ons dialog to get the new version. Otherwise, download Better Gmail 2 from Mozilla Add-ons. Quick observation, you do not have buzzes go into your inbox, now you do not see any new buzz, I only see you post links like twitter. You hardly ever respond to comments in buzz. Aren’t you missing out on how the tools was meant to be used? As place for a group conversation to take place? I understand that you may be doing this where I can not see in private buzzes but you seem to be promoting the none use of buzz. Its not twitter its buzz. I can’t wait for this to be in the Chrome version! Thanks Gina! I just opened Firefox and saw the update! Thank you. I noticed that your GCal add-on isn’t compatible with Firefox 3.6 (at least, I have version 0.4 which doesn’t seem to be compatible). Is there an update coming for that too down the line? For some reason the Sound Notify feature isn’t working for me. The sample on this page does work and the box in BGM2 is checked. Using FF 3.6.2–is this the problem? Better Gmail 2 kicks it. I have been reading you Wave book too.